William Charles Bicknese, 90 , of Wykoff, MN. 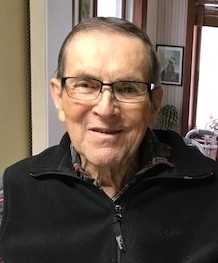 died on Thursday, March 21, 2019, at Ostrander Care & Rehab Center. A memorial service for Bill will be held at 11:00 A.M. on Saturday, March 30, 2019, at St. John’s Lutheran Church in Wykoff, MN. Visitation will be held from 9 to 11 a.m. on Saturday, at the church. William Charles Bicknese,” Bill,” ” Billy,” was born on August 21, 1928, the son of William Henry and Hollis (Silker) Bicknese at St. Mary’s Hospital in Rochester, MN. He was a 1946 graduate of Pillsbury Military Academy in Fairbault, MN. On December 6, 1946, Bill married Constance “Connie” Mosher, the love of his life, in Winona, MN. Bill went on to attend Winona State University from 1946-1948 earning a degree in Business. Bill began working at his father’s grain elevator which he then purchased in 1952. Upon retiring from the Bicknese Elevator and Mill in 1990, the business was sold to Joel and Joan Bicknese. In 1965, Bill bought a Cessna airplane and joined the International Flying Farmers organization. He credits Donald Eickhoff for giving him the flying bug. The four of them took many trips together including Europe, Germany, Hawaii, Mexico and throughout the United States. Bill was a member of St. John’s Lutheran Church and volunteered with their Food Shelf for 30 years. He also volunteered at the Wykoff Historical Society. Bill liked being in the outdoors enjoying God’s creations, watching the sun rise and set, gardening, planting flowers, mowing the lawn and naming the constellations of stars. Every year he looked forward to the annual Canadian fishing trips with his friends Ivan Cady, Doug Emerson, Ozzie Erdman and others. Bill was proud of his German heritage often singing or speaking German to his children and grandchildren. Bill and Connie never missed a chance to dance to the Blue Denim Farmers which his Uncle Walter and Cousin Wayne were members of. They also treasured their many Card Club friends and activities. Bill is survived by his wife of 72 years, Connie Bicknese of Wykoff, MN;children Steven (Dianne) Bicknese of Wykoff, MN, Marilyn (Richard) Erdman of Wykoff, MN: Nancy (Michael) Miller of Eden Prairie, MN. and Joel (Joan) Bicknese of Wykoff MN; 11 grandchildren, 23 great grandchildren and 1 great great grandchild; sister Carla (Raymond) Kaufmann of Deep Haven, MN.and brother-in-law Donald Clutterbuck of Houston, TX. He was preceded in death by his parents, sister LaDonna Clutterbuck, and a great granddaughter Scarlet Erdman.